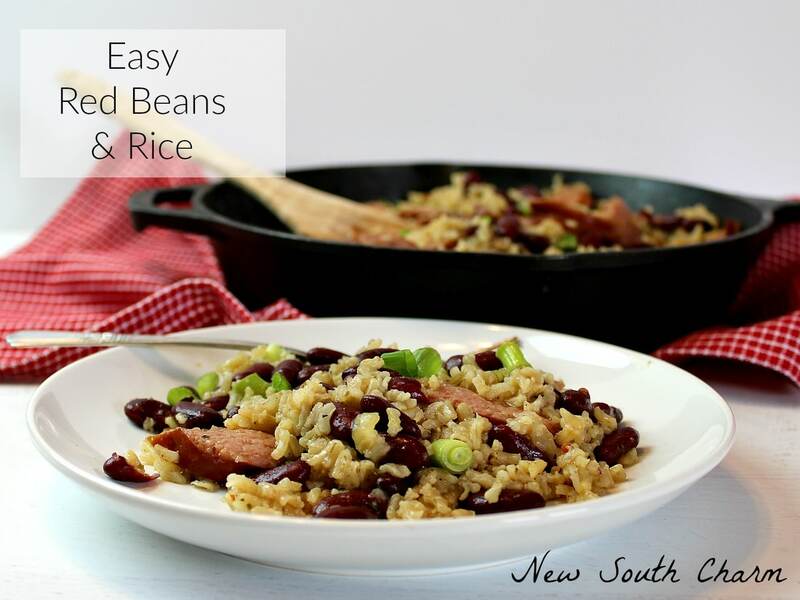 Easy Red Beans and Rice gives you all the flavor of the traditional version in just 30 minutes. Plus it cooks in just one skillet saving you tons of time when doing the dishes. This just might be the perfect recipe. When my husband and I first got married I made Red Beans and Rice one night for dinner. Only it was terrible. I mean it was awful and by awful I mean inedible I haven’t tried to make it since and that was ten years ago. Recently I decided to give it a try again. I’m so glad I did. This version was amazing and so easy to make that it was foolproof. I’m serious, this was so easy that I actually had to double check the instructions to make sure I didn’t miss a step. Slice a pound of Kielbasa sausage into half inch thick pieces. Dice a medium yellow onion. Mince a three cloves of garlic and set both aside. Over medum high heat warm a tablespoon of olive oil in a large skillet and melt a tablespoon of butter. Then add onion and sausage to skillet. Cook until onions become soft and translucent. Then mix in garlic cooking for one minute. Pour in chicken broth, rice, and Dark Red Kidney Beans. Also, add in Italian Seasoning, Cajun Seasoning and salt and pepper. Stir to combine. Bring to a boil, cover and reduce heat to medium low heat. Simmer for 20 minutes. I like to add a handful of fresh green onions for crunch and added flavor. 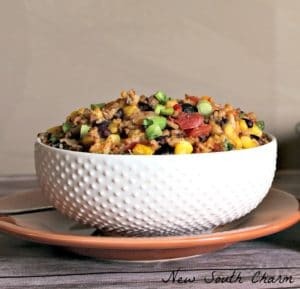 This is compleltey optional and you’ll love this recipe for Easy Red Beans and Rice either way. 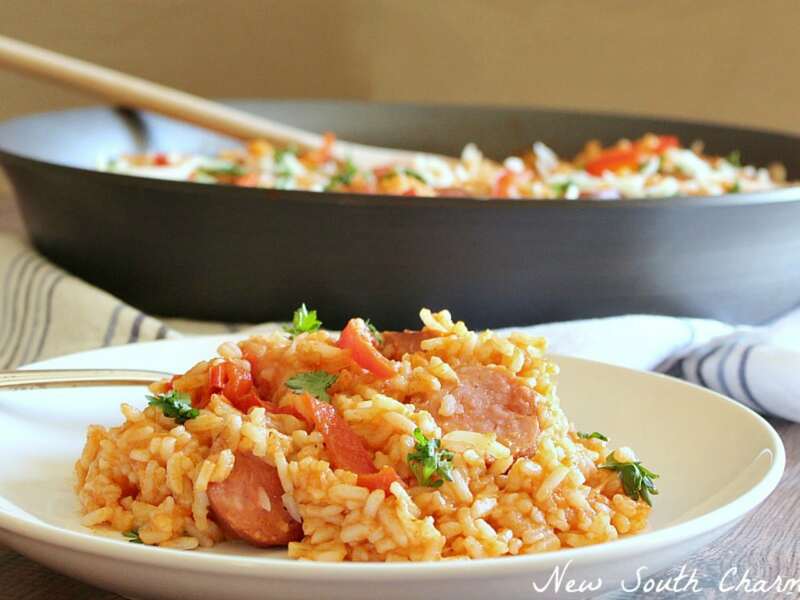 If you like your Cajun/Creole food spicy you can add in some red pepper flakes to the recipe. This will give the dish a little extra heat. In a large skillet warm olive oil for about a minute. Melt butter and add sausage and onions to the skillet. Cook until onions are tender and translucent. Add garlic and cook for one minute while stirring. Then pour in chicken broth, Kidney beans, rice, Italian Seasoning, Cajun Seasoning, Salt and pepper red pepper flakes (optional) Stir to combine. Bring everything to a boil, reduce heat to medium low cover and cook fro 20 minutes. Garnish with sliced scallions, and enjoy! 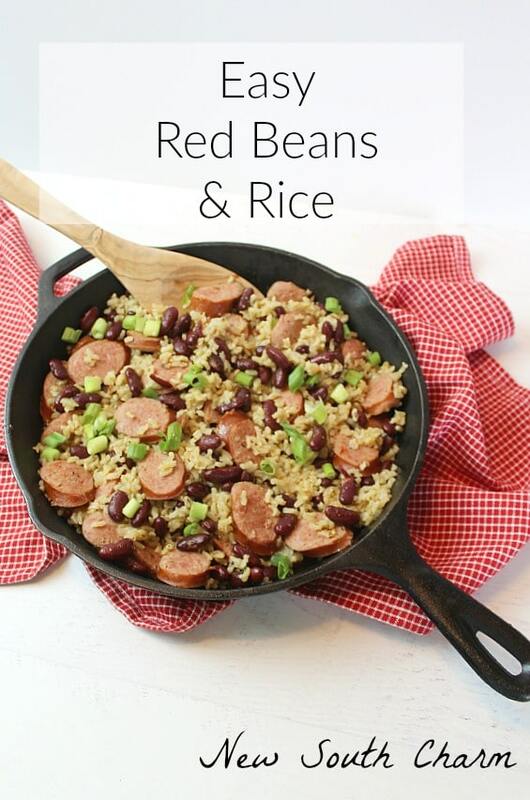 My kids love red beans and rice, sharing this for them. Thanks so much for adding it to the DI & DI Link Party also! This was one of the easiest recipes I’d made in a long, long time. I hope they give it a try it was great and it really was super easy to make. 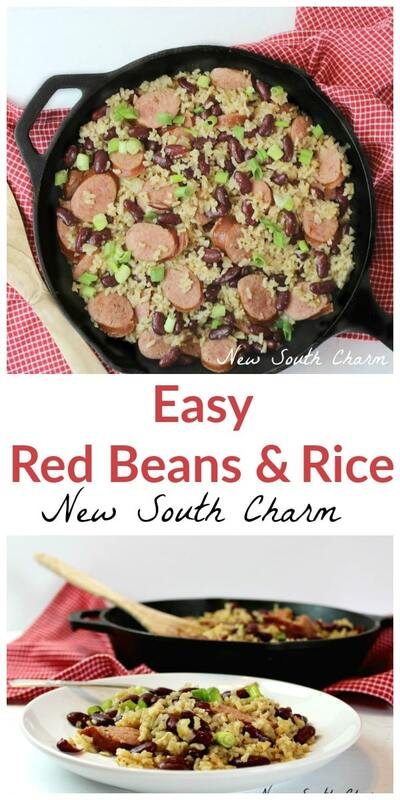 We grew up with red beans and I love them! This looks amazing. 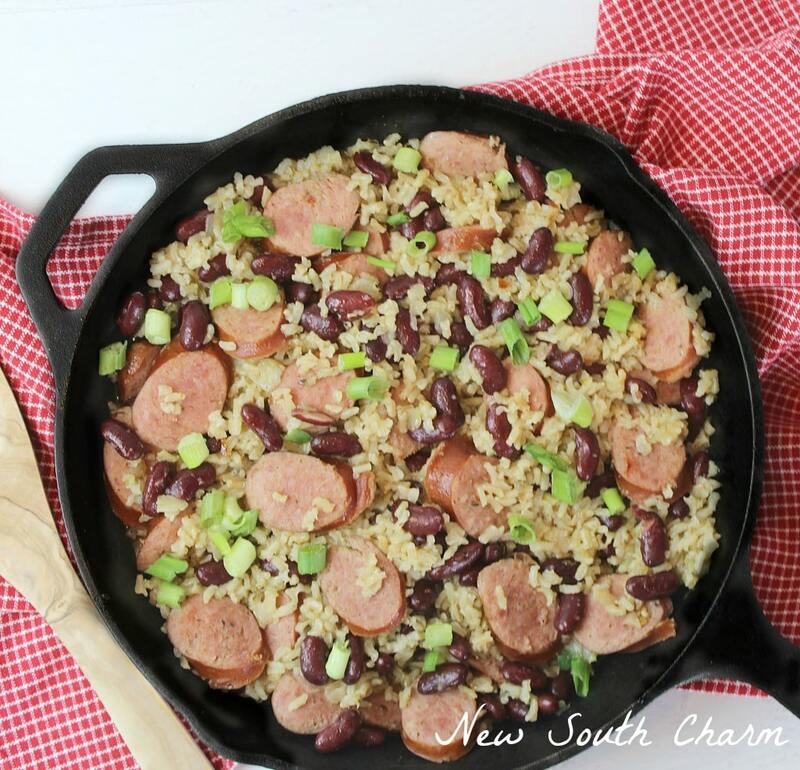 It looks and sounds like you have come a long way as a cook since getting married!Lol These red beans and rice look fantastic. 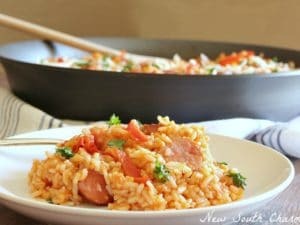 I love making things in the skillet too so we will have to try this one for sure. Thanks for sharing your second recipe and not the first. Ha ha. We will be trying it.